Wednesday night: Clouds increase. Lows around 50. Thursday: Mainly cloudy. Showers. High around 60. Friday: Showers and thunderstorms. Highs in the mid 60s. We start the day mostly dry, clouds north and sun south, with temperature in the 20s to low 30s north and 30s to low 40s south. A warm front working in from the west brings clouds into Vermont, New Hampshire, and Maine this morning with a chance of a few showers, or a wintry mix near the Canadian border. The Boston Red Sox parade happens under mostly sunny skies with a temperature in the upper 40s, and a chilly breeze from the southeast. Clouds thicken later in the day as temperatures gradually warm to the 50s for southern New England. By trick or treat time, sunset 5:45, scattered showers are likely in central and northern New England. 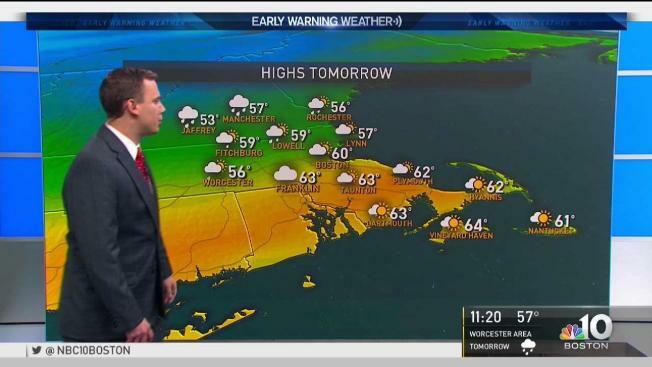 It should be dry for trick-or-treaters in southern New England with a temperature in the 40s. Low pressure moves into northern Maine tomorrow, with showers possible just about anywhere. A front extending southwest from that low pressure system all the way to Texas will become quite active. Weather headlines will be made well southwest of New England, because of a severe weather outbreak and perhaps flooding over the lower Midwest tomorrow and Friday. Here in New England the challenge is trying to figure out whether it’s going to be warmer or colder. With that front right over us tomorrow, plenty of clouds and a chance of showers. Probably in the 40s and 50s north, and maybe 60s south. Friday we start on the cool side of the front, but then it lifts to the north once again with rain becoming heavy at times, a chance of thunderstorms, especially late and at night, that should allow temperatures to push back up to the 60s in southern New England. Rain may be heavy enough for localized flash flooding, and storms may be strong enough to cause localized wind damage. The line of thunderstorms is still in eastern New England first thing Saturday, with a wet start. Rain may change to snow before handing in the mountains otherwise only gradual drying for New England Saturday. High pressure from Canada comes in with cooler and drier weather for Sunday, and plenty of sunshine.